The Minnesota branch of the ACLU on Thursday released a police dashcam video showing what they termed "a textbook case of excessive force" and called for an investigation into the circumstances surrounding the 2016 arrest. The video shows Agent Joe Joswiak of the Buffalo Ridge Drug Task Force, pulling over a motorist, identified as Anthony Promvongsa, 22, on July 28 of last year. Joswiak quickly runs out of his car, instantly yells a series of expletives at Promvongsa and commands him to get out of the car right befofre kneeing and punching the driver. The ACLU contends the arrest was unnecessarily physical and should spur an internal investigation by the Worthington Police Department. "Agent Joswiak claims Anthony refused his order to leave his car, but the video contradicts this assertion," the ACLU said in a statement. "Instead it shows a textbook case of excessive force." "We are calling for an investigation of Agent Joswiak’s behavior and for him to be held accountable for his brutal attack on Anthony Promvongsa, up to and including termination and prosecution," said Teresa Nelson, Executive Director of the ACLU of Minnesota. "Thus far, Agent Joswiak has received no punishment for this abhorrent treatment of Anthony," she added. "This sends a message that the department condones the officer’s behavior, which it should not." The ACLU of Minnesota claim there is a history of racial profiling and brutality by the Worthington Police Department, Nobles County Sheriff's Office and the Buffalo Ridge Drug Task Force. Joswiak is white, while Promvongsa is Asian. In a statement provided by the ACLU, Promvongsa also alleged that this type of police force is common in Worthington and that the "demoralizing" incident left him "scared of future interactions with the police." "I did not even have the opportunity to take off my seatbelt before I was literally blindsided with this unnecessary attack," Promvongsa said in the statement. "I immediately pulled over for the Worthington squad car and before I knew what was happening I was beat and ripped from my vehicle." The Buffalo Ridge Drug Task Force, Worthington Police Department and the Noble County Attorney’s Office released a joint statement on Thursday that said the video is a piece of evidence in a pending criminal case. “The video, viewed in a vacuum, shows only a short segment of the incident that is the basis of the criminal charges,” the statement read. It added that officials believe it would be inappropriate to comment further on a pending case. According to the criminal complaint, Promvongsa tailgated and accelerated at the car of an off-duty police officer, Colby Palmersheim, who had "prior police contacts" with Promvongsa. Palmersheim reported that he drove to the location of another off-duty police officer, Mark Riley, and said that he "believed Promvongsa was attempting to harm him." Promvongsa allegedly drove between the two off-duty officers’ cars at high speed before pulling back up to their cars and telling them that “he was going to go get his boys and come back to get them," according to the complaint. Riley relayed the incident to dispatch and Joswiak responded. The events shown in the video followed. Worthington Police Sgt. 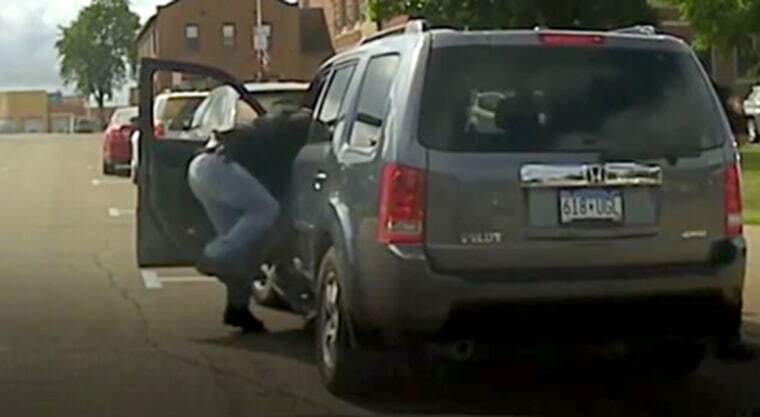 Tim Gaul, who teaches "use of force" to Worthington police officers, aided in the pursuit and arrest of Promvongsa, and is seen backing up Joswiak in the video. Gaul was named in two separate excessive force cases that were settled by the city of Worthington, records show. In both incidents he allegedly dislocated the plaintiffs' shoulder, one of whom was eight-months pregnant, according to court papers. Promvongsa was charged with two counts of assault with a dangerous weapon in the second degree, fleeing an officer in a motor vehicle, possession of a small amount of marijuana and driving with a revoked license. Promvongsa has pleaded not guilty to the charges and faces up to 17 years in prison if convicted. The Minnesota ACLU pushed back at the assertion that context would prove the officer’s actions correct. “The video does tell the full story of the stop,” Interim Legal Director of the Minnesota ACLU John Gordon told NBC News Thursday. "It tells the full story of not just an arrest, but a beating. No matter what happened before the video started the job of the police is to protect people and enforce the law — not acting like you’re above the law." Promvongsa and his lawyers were talking to the ACLU about potential options but, as of Thursday, the ACLU of Minnesota was clear that they were not providing Promvongsa with legal representation.